ICTV is the college’s award-winning, student-operated television production organization, serving 26,000 Tompkins County cable households. It is operated by and housed in the Roy H. Park School of Communications. Participants are volunteers, and IC students in any major are encouraged to work on the production teams, which are student managed. Programming includes news shows, sports shows, game shows, comedy, and drama. Newswatch 16 won first place for the best news story in the 2014 New York State Associated Press Broadcasters Association competition. ICTV was a finalist for best sportscast and best special broadcast in the 2013 National Student Production Awards from the College Broadcasters Inc.
As a child, David Muir ’95 was often glued to the local evening news. He would watch closely as Ron Curtis, the “Walter Cronkite of Syracuse,” reported the top stories of the day. Muir envisioned himself sitting behind the same wooden desk facing the camera alongside Curtis. Today, at 40, Muir has taken his childhood dream to the national level, becoming the anchor for ABC World News after longtime journalist Diane Sawyer stepped down. He is the youngest person ever to anchor the evening news on a national broadcast. Muir’s dream began to materialize when he came to the Roy H. Park School of Communications at Ithaca College. His freshman year he auditioned for the evening newscast on ICTV and landed one of the lead anchor slots. “I was honored that the television- radio seniors were willing to take a chance on a fresh-faced kid who’d just arrived,” said Muir. Over the next three years, Muir continued to excel in and out of the classroom. The opportunities he had at Ithaca College allowed him to find his bearings as a storyteller and his voice as a reporter. Muir’s first correspondent position brought him to WCVB in Boston, Massachusetts. But shortly thereafter he returned to Syracuse, New York, to report for his hometown station, WTVH. 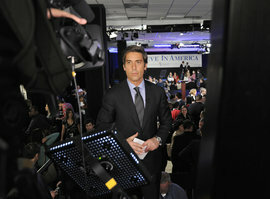 In 2003 he joined ABC as an overnight news anchor, where his career in national news took off. In 2011, Muir became the sole anchor of the weekend edition of ABC’s evening newscasts. His work included traveling to Mogadishu to report on a devastating famine and taking viewers on a 100-mile trek from Somalia to refugee camps in Kenya. This fall he took over the weekday broadcasts of ABC World News. He also continues in his coanchor position on 20/20 and is the managing editor for World News. While there are some who question the future of broadcast news, Muir pointed out that more than 25 million viewers still tune in each night. Muir said it’s exciting to see how viewers can collaborate with journalists through social media. “It’s knocked down the barriers that once existed with network news,” he said. “I’m getting immediate feedback, and I try to tweet back to viewers during commercial breaks. At any given moment, a viewer can reach out, weigh in, and in many cases inspire the next question I ask on the air.” Muir is just one of several successful alumni in broadcast news across the country. You can read some of their stories here. His first job after IC took him to WTOL in Toledo, Ohio, where he interviewed the wife of a man who had been having health issues. “It took the fire department half an hour to respond [to their call], and in that time the gentleman had passed away. In part, through our coverage, the city brought in more emergency responders during overnight hours,” he said. That story landed Wright a regional Emmy nomination. One day he hopes to report for a major network, as Muir does. Local stories often end up getting national coverage. Three months after graduating from IC, Kelsey Anderson joined the KBOI 2 news team in Boise, Idaho, and found herself covering one of the largest and most controversial national news stories at the time. Idaho native Sgt. Bowe Bergdahl was about to be returned to U.S. custody after being traded for five Taliban detainees. KBOI was one of the first news stations to cover the story, and Anderson was reporting alongside major network names such as Bigad Shaban from CBS and Nick Valencia from CNN. “I had a camera in my hand the day I started my sophomore year. I got to do it all in Newswatch." “Not only was I reporting right next to some of the biggest names in broadcast journalism, but I was also talking about an extremely controversial subject and had about a fourth of the crew and supplies they did. But I was keeping up,” said Anderson.